While driving in poor weather such as rain, snow, sleet or even fog may be challenging, it is no excuse for an accident, especially by a professional truck driver. Commercial trucks such as semi-trailers that are on the road up to 70 hours a week are bound to run into bad weather on a consistent basis. These drivers are trained to know how to handle poor weather conditions and should know when to slow down or get off the road altogether when it becomes unsafe to continue driving. Winter. If it is very slippery, you should not drive at all. Unfortunately one of the leading reason that truck accidents happen in poor weather is due to the pressure on drivers to get their load delivered, regardless of the risk to others on the road. Pressure to meet time schedules and to get to their destination can persuade truck drivers to continue driving even when it becomes unsafe or to drive faster than they should in inclement weather. When a large truck causes an accident that injures occupants of other vehicles in poor weather, using the road conditions as a reason for the crash is not acceptable. 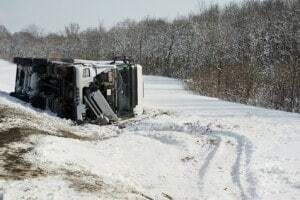 Victims who have been injured in these types of accidents need an experienced truck injury attorney that will investigate why this driver was on the road if the weather was poor and that will fight for fair compensation for their injuries. These types of accidents can be complicated, so having an attorney who understands commercial driving regulations is essential to ensuring that all liable parties are held financially responsible for their contribution to the accident and injuries. One of the defenses favored by trucking companies to evade responsibility for an accident involving significant injuries to is to blame the weather conditions at the time of the collision. While such defenses may be commonly used by commercial carriers, the Federal Law imposes regulations on truck drivers to safely operate their vehicles— regardless of the climate. Rosenfeld Injury Lawyers LLC is committed to fully prosecuting semi truck accidents involving all scenarios. Our attorneys use applicable Federal and State regulations to ensure that you and your family receive the compensation that you deserve. Contact us now to discuss your case with an attorney who has successfully prosecuted cases similar to yours.